Over the next few weeks I am going to post reviews of what I consider great community cookbooks and why I feel as I do. You will have to decide if you agree and it is completely OK if you don't. However, I would be interested in your opinions, particularly if they differ from mine. Some of the titles I choose will be new and some older. The purpose of this exercise is to motivate anyone thinking about developing a community cookbook to put some thought into the various elements that make this important genre of books so great. 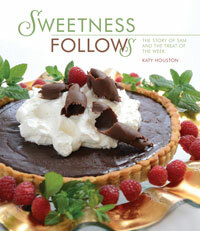 In this first post I am going to highlight a brand new title that was authored by Katy Houston from Ridgeland, MS. Katy's book is titled Sweetness Follows: The Story of Sam and the Treat of the Week. This is the first cookbook that I read which brought tears to my eyes. I chose this title as an example of a great community cookbook for a variety of reasons, but the main one is the appeal to the community to share in this title. Sam was Katy's son's best friend when he was hit by a drunk driver while riding a bicycle away at college in Athens, Georgia. Sam endured significant injuries and the recovery story is dramatic. The book is made up of stories from friends and caregivers plus the fabulous dessert recipes that Katy made for Sam during his recovery and rehab. The book is a combination of images both physical and mental which bring the readers' emotions into the book, motivating one to keep turning the pages to discover the next scrumptious delicacy. The book is simple in its design and yet very classy. Since the compilation of recipes is limited to 128 pages it is not too daunting yet a great value for $21.95. This title appeals to a distinct community and yet it can also go outside of this group. Anyone who discovers it and has been affected by a close friend or relative in similar circumstances will be immediately drawn in. This cookbook will motivate readers to understand how a simple act of kindness through sharing good food can motivate, heal and stimulate. The stories are an excellent example of how to involve a community. What could have been a story of two families grows as the doctors, nurses, educators and friends enter the picture through their stories of this remarkable recovery. And the cherry on top of the dessert is the beautiful photography that was given as a part of the final product. Sweetness Follows is a beautiful example of reaching out to a community through food. If you have a chance to pick up a copy of this book It will be available here in early October. So you feel loose and restored enough and you are enthusiastic to get http://www.bestcustomessay.org/essay-writing down to business. Hold up, there still may be a couple parts you've missed. I agree with your idea. essaymarket.co.uk You look like very talented.It is very happy to meet you. Thank you! I see your point ! http://www.online-essay-writer.org/ Thanks for information!